Trucks are used for a wide range of operations and these vehicles are born to deal with massive payloads and rough conditions. The construction trucks however, usually suffer the harshest treatment, as they have to deal with muddy terrains and unfriendly amount of loads. The TGS is the most roughed truck in the MAN’s lineup and it was designed for the arduous missions which require strong off road abilities and high payloads capacities. 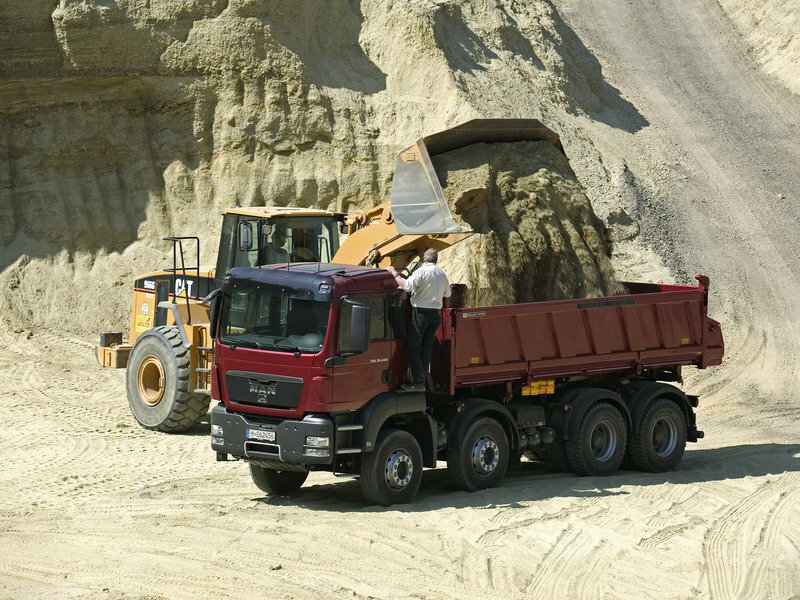 The truck can be used for both building sites or in short-haul transport as it’s available in a wide range of versions. 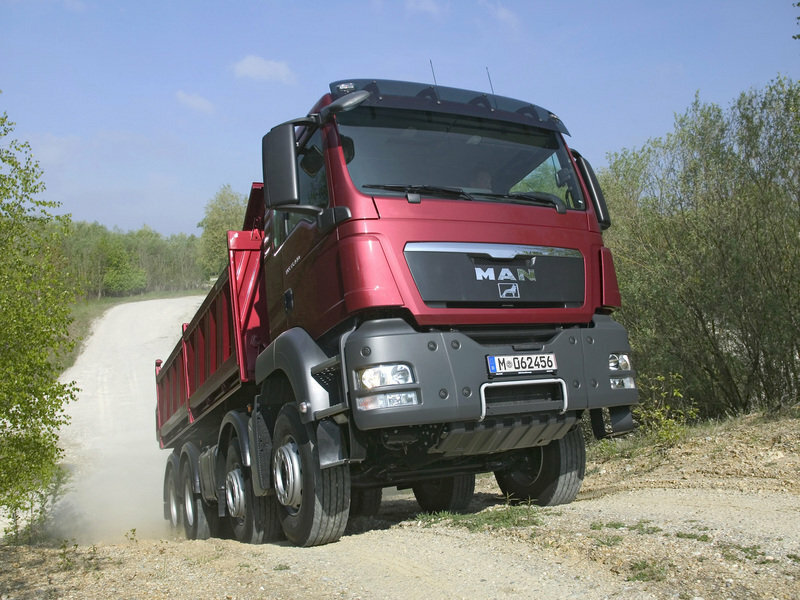 The MAN TGS range consists of three cab configurations including M, L and LX models. As most of today’s construction trucks, the MAN TGS design is as roughed as it can be. If its overall stance didn’t convinced you about its off road abilities, then take a look of the high ground clearance or the massive wheels which definitely look like they mean serious business. The latest generation of the MAN TGS looks as purposeful as ever, and is easily capable of finishing the most difficult missions with the determination of a mountain horse. The superior grille bares the shiny MAN logo in its center and above it we find the same chrome strip that shines at the front of the TGX long haul model. The lower part of the body is made of black plastic and features two air intakes which continue the “V” shape started by the superior grille, forming a nice design pattern which makes the truck more appealing to the eye. We’re never big fans of the MAN’s rectangular headlights, but in this case, we’ll have to admit that they cope well with the rough character of the truck. Climb inside and the truck will welcome you with an ergonomic and strong build cabin. The overall design is better than what you get from the Iveco Trakker and it’s very close to what the Renault Premium has to offer. All the controls are located intuitively and everything seems to be in the right place. The instrument cluster is also easy to read and features both analogue and digital displays which are clearly arranged. There is also an optional axle load display, which lets you use the full payload without overloading. Beside this, components such as phone and radio are also integrated in the information management. We also like the ergonomically designed steering wheel which is a bit smaller in diameter than other units in the segment. 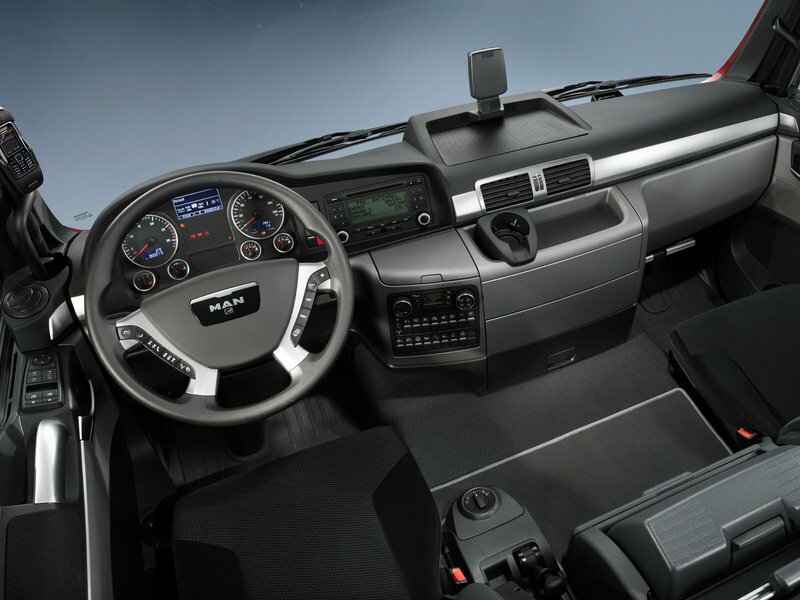 The multi-function steering wheel is part of the standard equipment in the L and LX cab, while for the M cab it is available as an option. Moreover, it can also be adjusted for both reach and rake, so you won’t have any problems in finding a comfortable driving position. The driver’s seats are also well crafted to offer proper back support and they feature pneumatic height adjustments and vertical damper settings. Moreover they are available with a seat heater, a pneumatic lumbar support, side contour and shoulder adjustment, hydraulically damped horizontal suspension and adjustable seat cushion depth. The co-driver’s seat can be also adjusted through to the resting position, offering a good resting place when the truck is parked. The bottom bunks feature a slatted frame, five hardness zones and cold foam mattress with seven hardness zones which makes them fairly comfortable. The MAN TGS is fitted with large storage boxes above the windscreen in the LX and a three section roof stowage unit in the M and L cab. The multifunctional stowage space inside the L and LX cab, can be also used as an alternative to the upper bunks. The central console is also fitted with a few useful stowage facilities, compartment for glasses, a pen and beaker holder and a large drawer while under the bunk there is placed for an optional refrigerator box. The MAN TGS is equipped with D20 and D26 engines with outputs between 320 hp and 540 hp. The common rail units are Euro 4 and Euro 5 compliant and were tweaked to have less fuel consumption and a long lifetime. Moreover, they have the lowest power/weight ratio in their class and are designed to last 1.5 million kilometres with intervals between maintenance of 120 000 kilometres, being among the most reliable units in the segment. The engines can be mated on a 16 speed manual unit with servo shift for low gear change force and short stick travel. For MAN TGS road models there is an optionally ComfortShift available, where the clutch can be operated while driving by a button on the gear stick knob which permits you to change the gears without taking your hand off the steering wheel. There truck can be also equipped with the automated 12-speed TipMatic gearbox available in three versions (Profi, Fleet and Off-road) which can be operated by the driver fully automatically or manually by means of a lever mounted on the steering wheel. The MAN TGS offers a wide variety of suspension from leaf/leaf through leaf/air to full air. The leaf suspension with parabolic springs is combined with shock absorbers and stabiliser in order to offer good roll stabilization and a balanced handling. The air suspension with ECAS electronic control keeps the same driving level regardless of the load. Thanks to this system, the chassis can be lowered by 90 mm from the driving level and raised by 190 mm. The truck is also available with an alternative between conventional rear-wheel and classic all-wheel drive named the HydroDrive, which basically is an engageable hydrostatic front-axle drive which offers more traction and full driving power for on-road vehicles. 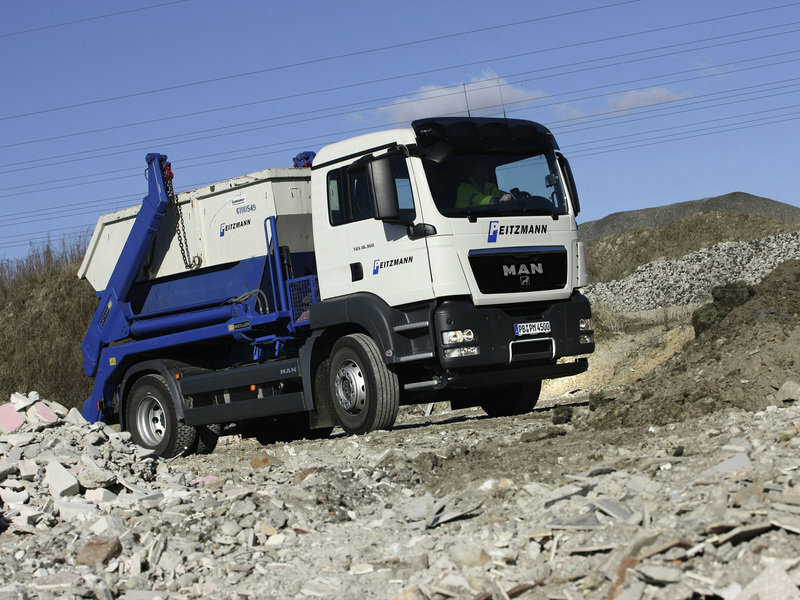 The MAN TGS is one of the best construction vehicles available on today’s market. 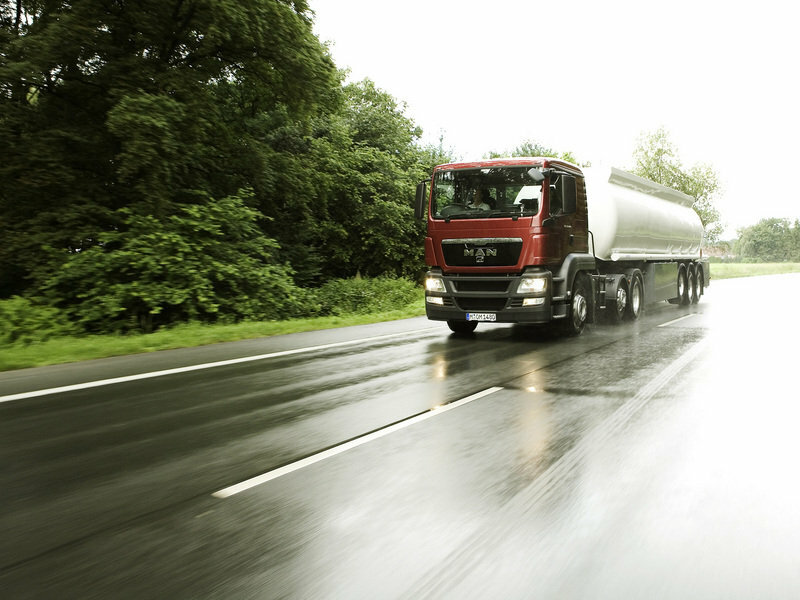 The truck goes head to head with models like the Mercedes Axor, Renault Premium or Iveco Trakker. Compared to its rivals the TGS is equipped with better technologies which improve the truck’s performances and its payload capacity. The engines are also pretty efficient and can cope well with the rough character of the track. Moreover, the cabin is also a pretty nice place to be in and is available with a host of premium features which can be rivaled only by the Mercedes Axor.